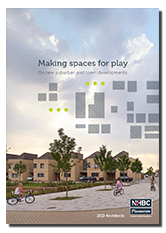 This report summarises new work which investigates (through observational analysis) how children and adults use outdoor communal space. It looks in detail at play (a proxy for overall social activity) and relates this to a simple mapping exercise that scores four physical characteristics of new developments. Though only a pilot exercise the methodology shows promise as a way of predicting, at an early stage in planning, future social outcomes. Where beneficial features are absent, social activity and play may be a small fraction of that observed on the developments with the higher mapping scores. Explains the focus on play, its importance to the development of children, and the importance of outdoor communal space. Introduces the seven developments included in the study – all are medium density suburban/town developments.